The Stauer jewelry and watch catalog spoils you with exquisite jewelry & watches, as well as other smart luxuries featured at surprising prices. Enter the keycode - CAT20OFF - at checkout on the Stauer website. Stauer Jewelry - Forget about jet lag, delays, and lost baggage, we've brought the world of affordable good looks to you. We go to the ends of the globe to find spectacular deals on precious gems, natural stones, and artisan materials. We work directly with the world's finest goldsmiths and silversmiths. Indulge yourself with Stauer's stunning selection of genuine gemstones, precious metals, and scientific creations. Stauer Watches - Every Stauer timepiece is a tribute to the history of watchmaking. Built for performance and precision. Choose from vintage-inspired classics, thoroughly modern designs, or limited editions. Our watches are powered through various movements and many feature intricate complications such as chronograph and calendar subdials. 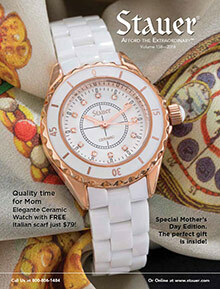 Take your time and browse the world of Stauer Watches. Handbags - Our impeccably designed line of handbags will get along beautifully with your wallet. As, we've done our homework and legwork to make sure you have a top-notch designer quality bag without the high-end designer price tag. And, we did it without compromising quality one bit. Take a look and see why it's easy to get carried away with our handbag collection. Gifts & Collectibles - Vintage car and aircraft replicas that do the full-size models justice. Gorgeous enameled eggs fashioned after the famous Russian Imperial Eggs that open to reveal a delightful surprise. U.S. Mint coin jewelry, keepsake boxes and other treasures to give or keep. Since 2003, we have shopped the world for the rare, the beautiful, and the innovative and have brought these treasures and their compelling stories to our customers. Our jewelry,�watches, handbags, and collectibles have been thoughtfully selected to deliver classic and refined style with uncompromising value.